Potential life-threatening toxic ingestions should also be addressed. Toxicity from ingestion of substances such as ipecac has been associated with severe cardiac disease. Acute pancreatitis should be considered. The ability to recognize acute pancreatitis may be impaired because of the assumption that an elevated amylase level is due to vomiting. Serum lipase levels should be obtained or computed tomography (CT) considered if epigastric tenderness is significant. Comprehensive recommendations for the management of bulimia nervosa have been provided by the American Psychiatric Association (APA) in Practice Guidelines for the Treatment of Patients With Eating Disorders, Third Edition. Complications of bulimia that are treatable in the emergency setting may include volume depletion, electrolyte abnormalities, esophagitis, Mallory-Weiss tear, esophageal or gastric rupture (see the image below), pancreatitis, arrhythmia,  and adverse effects of medications (eg, ipecac or appetite suppressants). 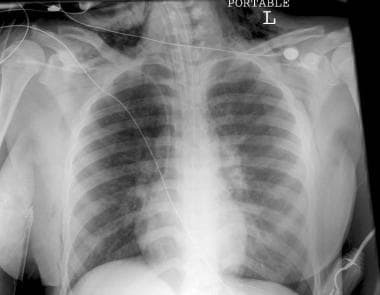 Chest radiograph demonstrates pneumomediastinum, which can occur in association with esophageal rupture from forceful vomiting. Associated illnesses, including depression, anxiety disorders, and substance abuse, increase the risk of other illness and injury  —hence the recommendation to question patients directly regarding suicidal ideation. Patients should be warned against the use of diet pills and amphetamines, as well as energy pills and diet teas that claim to be all-natural. All-natural supplements often contain herbal forms of caffeine and ephedrine and have been associated with hypertension and cerebrovascular accident. As new therapies to treat bulimia are introduced, their potential adverse effects must be taken into account. Such adverse effects may include nephrolithiasis, glaucoma, seizure, and metabolic derangement. Admission to a medical facility is warranted for patients with significant electrolyte or metabolic disturbance or another physical complication of binging or purging (eg, Mallory-Weiss tear, esophageal rupture, or pancreatitis). All patients suspected of having an eating disorder should be referred to a psychiatrist for further evaluation. If possible, arrangements should be made for follow-up within 2 days. Gordon KH, Simonich H, Wonderlich SA, Dhankikar S, Crosby RD, Cao L, et al. Emotion Dysregulation and Affective Intensity Mediate the Relationship Between Childhood Abuse and Suicide-Related Behaviors Among Women with Bulimia Nervosa. Suicide Life Threat Behav. 2016 Feb. 46 (1):79-87. [Medline]. Smith CE, Pisetsky EM, Wonderlich SA, Crosby RD, Mitchell JE, Joiner TE, et al. Is childhood trauma associated with lifetime suicide attempts in women with bulimia nervosa?. Eat Weight Disord. 2016 Jun. 21 (2):199-204. [Medline]. [Full Text]. Mascolo M, Trent S, Colwell C, Mehler PS. What the emergency department needs to know when caring for your patients with eating disorders. Int J Eat Disord. 2012 Dec. 45(8):977-81. [Medline]. Trent SA, Moreira ME, Colwell CB, Mehler PS. ED management of patients with eating disorders. Am J Emerg Med. 2013 May. 31(5):859-65. [Medline]. Ozier AD, Henry BW, American Dietetic Association. Position of the American Dietetic Association: nutrition intervention in the treatment of eating disorders. J Am Diet Assoc. 2011 Aug. 111 (8):1236-41. [Medline]. Suri R, Poist ES, Hager WD, Gross JB. Unrecognized bulimia nervosa: a potential cause of perioperative cardiac dysrhythmias. Can J Anaesth. 1999 Nov. 46(11):1048-52. [Medline]. Levinson CA, Zerwas S, Calebs B, Forbush K, Kordy H, Watson H, et al. The core symptoms of bulimia nervosa, anxiety, and depression: A network analysis. J Abnorm Psychol. 2017 Apr. 126 (3):340-354. [Medline]. [Full Text]. Burton AL, Abbott MJ, Modini M, Touyz S. Psychometric evaluation of self-report measures of binge-eating symptoms and related psychopathology: A systematic review of the literature. Int J Eat Disord. 2016 Feb. 49 (2):123-40. [Medline]. Grall-Bronnec M, Guillou-Landreat M, Vénisse JL. [Emergency situations concerning eating disorders]. Rev Prat. 2008 Jan 31. 58(2):161-5. [Medline]. The authors and editors of Medscape Reference gratefully acknowledge the contributions of previous author Tammy Foster, MD, to the development and writing of the source article.